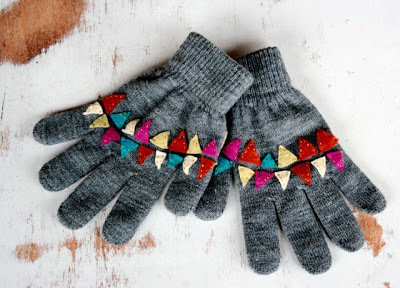 blue eyed freckle: Bunting gloves tutorial and a GIVEAWAY! 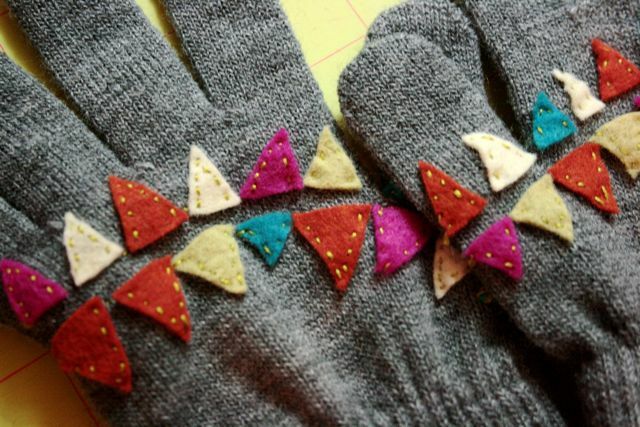 Bunting gloves tutorial and a GIVEAWAY! 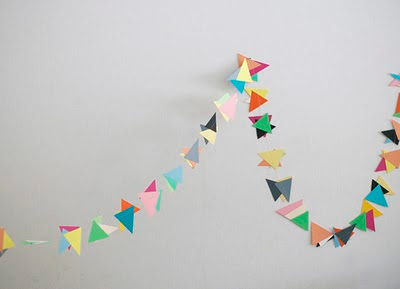 1. cut small triangles out of various colors or shades of felt. 2. place them on your gloves to decide how you want them configured. 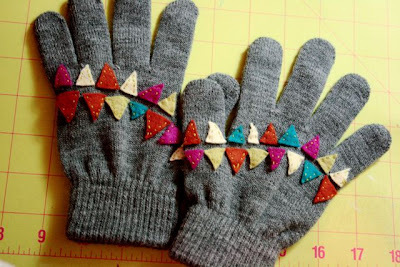 3. put a TINY dot of hot glue on each triangle and place it on the glove (this will hold it in place while you embroider). 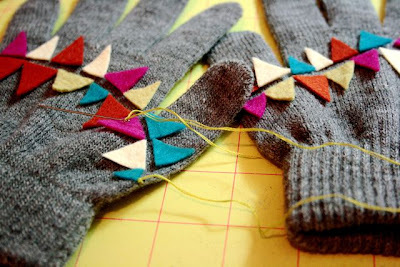 4. cut a length of embroidery floss and take apart two of the strings, instead of using all the threads. (you will use the other threads when this one runs out). 4. tie a small knot at the beginning of one triangle (I did it on the outside because it was hard to get inside the glove and do it, but if you can, that would be even better). I used a dab of hot glue on the knot so it won't come loose. 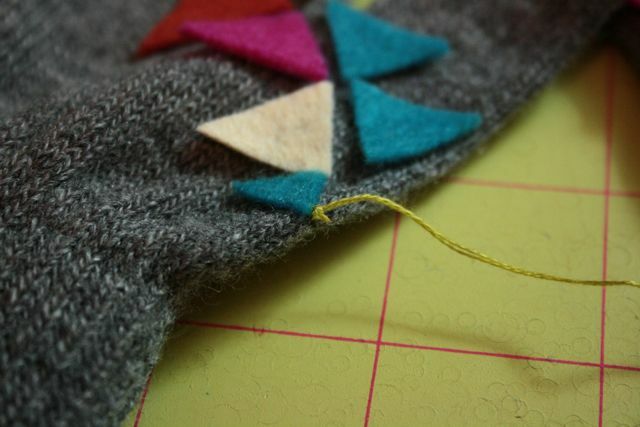 5. embroider the "V" part of each triangle (don't need to do the 3rd side) until your thread runs out. Then start a new one (when you end the other, tie a knot and dot the hot glue). And there you have it! 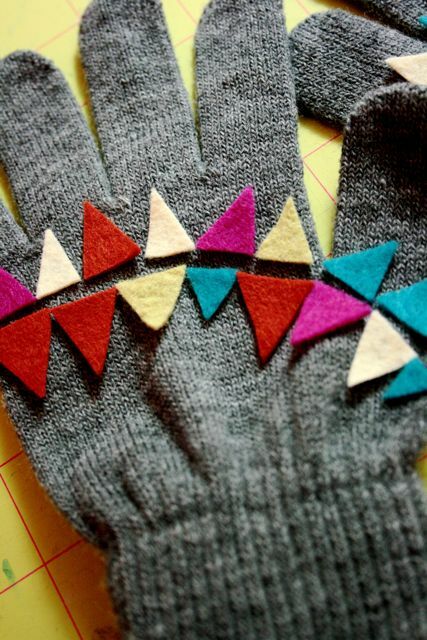 your own bunting gloves! These are great!! TOO cute. I love this! After you first posted about those gloves I kept the image up in a browser tab for a few days. I'm not sure we'll need gloves much longer in Pasadena, but it's still cold in my shop! !00% impressed! It'll be glove weather for a while here. They look so festive! you did a great job! I wear gloves like these everyday on the ice! I would love to have some custom fancy flair on my fingertips! 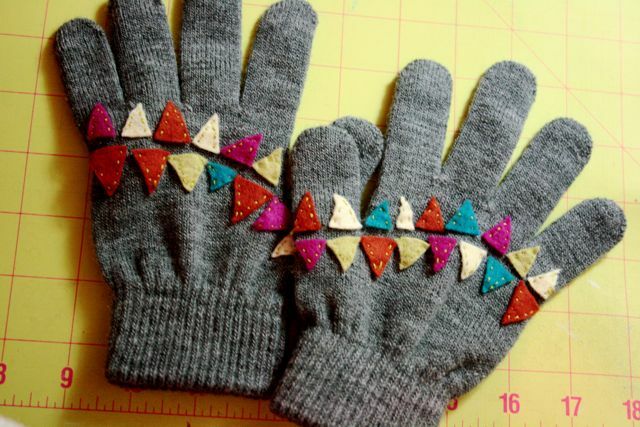 very cute gloves. i should make some for the birthdays coming up in my family! You have given some fabulous collection of gloves. These gloves are really very attractive. I like these gloves very much and hope everybody also loves it. Those are SO MUCH FUN! I love the color. What a great way to punch up a dreary day. Thanks so much for the how-to, I'll be linking to this. Awesome tutorial! Thank you so much - I'll put a link to it from my crafty goodness blog! This is SO cute!!!!! What a great idea. Props,my dear! Adorable! I am a follower, I "liked" you on fb, and I blogged about your giveaway (and put a link to the blog on facebook). here's my post! I love your gloves! The weather is dreary and these would certainly pick up my day. Blogged about your great giveaway! I hope I win, these are really cute! So fun! I would LOVE to wear these out in the cold! What a cute idea. These are so gorgeous!! I would wear them everywhere!! These are so cute! I want to make my own. Thanks for posting the tutorial. How did I miss this. I read EVERY thing you post?!?!?! These are amazing! I am going to share a link with my readers! I'm always looking for new ideas to inspire sewing in the 12 year old I mentor. 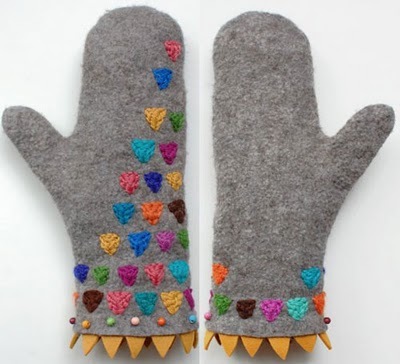 These will be a hit and we can make matching gloves. I love the look of these gloves, but how well does the sewn area stretch when you put them on? I am afraid they would limit the stretch of the glove. I want to make these for my grandkids, so let me know if there is anything I can do to no inhibit the stretch.